Manufacturing USA today released its 2017 Annual Report. The report describes the program’s work in moving discoveries from the Nation’s universities and research laboratories into production in the U.S. It also describes the program’s fourteen institutes successes in developing world-changing manufacturing technology and equipping the U.S. manufacturing workforce with the high-value skills needed to make tomorrow’s products. Manufacturing USA grew substantially in 2017, adding 6 new institutes to make a total of 14 institutes, sponsored by the departments of Energy, Defense and Commerce. At the same time, commitments of support over the program’s life have grown to more than $3 billion, comprised of $1 billion of federal funds matched by over $2 billion of non-federal investment, representing a remarkably effective catalyzation of matching investment. Total memberships grew over 50 percent this year to 1,291. Of these, 65 percent are industry members, and of the industry members, 65 percent are small and mid-sized. The fourteen Manufacturing USA institutes, sponsored by the Departments of Commerce, Defense, and Energy, conducted nearly 270 major applied research and development projects of high priority to broad industry sectors. The program saw tremendous growth in institute-led workforce efforts in advanced manufacturing, educator/trainer instruction, and science, technology, engineering, and mathematics (STEM) activities, resulting in over 191,000 workers, students, and educators participating in Manufacturing USA-led workforce efforts — an astounding seven-fold increase this year in the number of individuals enriched by the program. 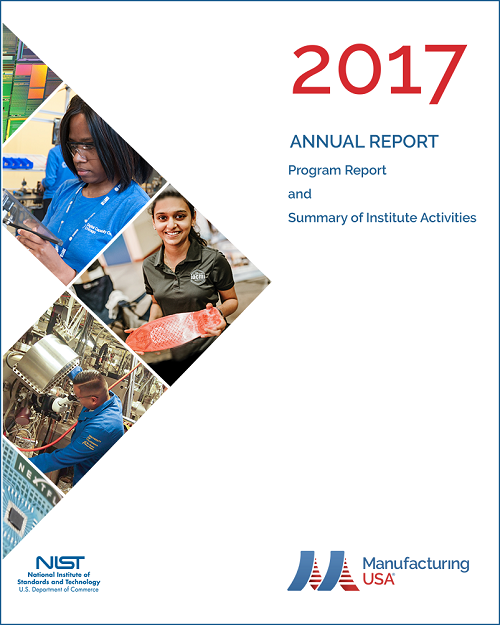 The annual report incorporates material from the 2017 Program Report (available here) submitted to Congress and includes additional information about the major accomplishments of the Manufacturing USA institutes in Fiscal Year 2017. Manufacturing USA Annual Report, Fiscal Year 2017, Advanced Manufacturing National Program Office, National Institute of Standards and Technology, Department of Commerce (2018), https://doi.org/10.6028/NIST.AMS.600-3.